When you’re reviewing a show, it’s usually easy to not give the act away in your write up. However, sometimes you come across a show so stunningly good, that you just want to tell everybody every last detail about it. Barbara Nice: Raffle at the Lettuce Bacon Tomato theatre (LBT, Huddersfield) falls straight into that category. A comedy act which is unique, and sees people come back to see her time and time again. The character came out of Peter Kay’s Phoenix Nights. Barbara Nice was the barmaid in the hit show, and Janice Connelly has taken her on the road. In doing so she has made the comedy circuit a better place. In the intimate comedy cellar, the act is a bit of laugh-a-minute storytelling, mixed together with a bit of improv with the 100-strong audience. There’s a lot of crowd participation. Occasionally with the unsuspecting individual, but more so with the entire group. And it’s always amusing; no-one is made to feel silly. In fact, you prefer to be picked on than not picked on! Yours truly was asked to stand up and demonstrate something that the entire crowd needed to do during her re-enactment of the Winter Olympics Curling final involving a kettle! The end result being so silly, but so funny. And not long after we were all up dancing, as Barbara Nice (Barbara as in Streisand, Nice as in the biscuit) taught us some hot moves that her neighbour had shown her not so long ago. After a twenty-minute interval, the second half was a raffle. Entirely a raffle. A 45 minute raffle. How can that be funny? Believe me, it is. Hilariously. Throughout the raffle, there was much more interaction. We had a bit of a sing-a-long, with the chance to win prizes that a contestant on Bullseye would have been proud to take home. I’ve never seen a comedy show where I’ve laughed right from the first second to the very end. And my jaws hurt. I know that’s a popular saying, but this time they really did. I’m in no doubt at all that this is the best comedy show that I’ve ever seen. It’s not stand up, it’s better than stand up, and if you want to find out how to obtain an Apple Mac for £9.99, this is the show for you. And the highlight of this show, and probably any other show at Lawrence Batley Theatre this year, comes at the end. On this occasion (she told us she might do it, she doesn’t always) we were all taken outside for a game of what time is it Mr Wolf. In the courtyard of the theatre. It’s freezing cold, but none of us care. We’re in hysterics and it’s a brilliant way to end a fantastic show. One thing that I have to mention to finish is that the show is so well done, it doesn’t rely on bad language. Not one swear word left Barbara Nice’s lips. She doesn’t need to use them. 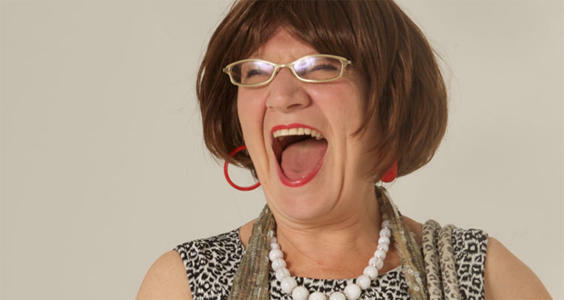 If you see Mrs Barbara Nice touring near you, make sure you enquire about tickets. I promise that you won’t regret it.